This research is part of People's Peacemaking Perspectives project, a joint initiative implemented by Conciliation Resources and Saferworld and financed under the European Commission's Instrument for Stability. The project provides European Union institutions with analysis and recommendations based on the opinions and experiences of local people in a range of countries and regions affected by fragility and violent conflict. 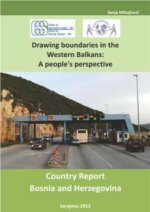 The borders of some countries in the Western Balkans remain disputed and unresolved, posing a threat to regional peace and stability and creating an obstacle to European Intergration. This report focuses on five areas in the region where border/boundary demarcation has been problematic, with a view to informing European Union engagement.